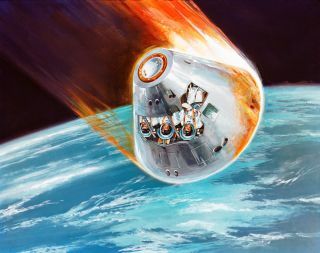 An artist's illustration of the superhot plasma around a spacecraft like NASA's Apollo command module that can block communications and cause a radio blackout during the critical re-entry of a spacecraft. When future spacecraft re-enter the atmosphere, a new kind of antenna might help them keep in contact with ground control, despite the fiery sheaths of superhot plasma around them, researchers say. The technology might also help keep communication lines open to other hypersonic vehicles, such as military planes and ballistic missiles. As NASA's Apollo 13 crisis revealed in 1970, this radio silence can be fraught with extraordinary tension. As the crippled spacecraft plummeted back toward Earth, the communications blackout lasted more than a minute longer than expected, leaving ground control in tortured suspense over whether the three astronauts aboard had survived. "When a re-entry vehicle is unable to be connected, the only thing you can do is pray for it," study lead author Xiaotian Gao, a physicist at the Harbin Institute of Technology in China, said in a statement. Prior studies have tried to solve this communication blackout problem, but they all had their shortcomings. For instance, scientists have suggested changing the shape of hypersonic vehicles, because sharp-nosed vehicles have thinner plasma sheaths than blunt-nosed ones. But sometimes, blunt-nosed bodies are preferable because they can withstand heat better and slow down more quickly. Other approaches involve using magnetic fields to control the plasma sheath, or injecting water or other liquids into the plasma sheath to make it more permeable to radio signals, but these methods require extra power and weight, respectively. Now, Gao and his colleague Binhao Jiang, also of the Harbin Institute of Technology, reveal they might be able to use the plasma sheath itself to enhance signals from antennas to maintain communications during hypersonic flight. "We may have found a novel approach to solve the communication blackout problem," Gao told Space.com. The researchers explained that, when the electromagnetic fluctuations of radio antennas are in sync with those of their surroundings, a phenomenon known as resonance can amplify radio signals. One example of resonance is the way a playground swing will climb higher from repeated pushes. Another well-known example of resonance can be seen when an opera singer hits just the right note to cause a champagne glass to resonate and shatter. The researchers suggested adding a carefully designed layer of electrically insulating material onto communications antennas that would essentially store electrical energy. In combination with the plasma sheath, this "matched layer" would generate resonant conditions during hypersonic flight, and radio signals could propagate through, they explained. For the resonance to work, the thickness of this matched layer and the plasma sheath must be smaller than the wavelengths of the radio signals used for communication, the scientists noted. The properties of the plasma sheath can vary during flight, complicating any efforts to generate resonance, but the researchers suggested the matched layer can compensate for these changes if it is made from a material whose electromagnetic properties can be altered electrically. "We don't need to know exactly the properties of the plasma layer, but we need to know the ranges for these properties," Gao said in a statement. "The matched layer will be adjusted by an automatic control system, so we only need to know the ranges to make sure this whole system can work appropriately." The researchers noted that their new approach has a number of advantages over prior attempts to solve the communication blackout problem: It does not rely on a particular shape of vehicle in order to work, nor does it consume additional energy or require extra weight. Still, Gao cautioned that this finding is only a theoretical prediction. "It needs to be verified by further experiments," he said. The researchers do not plan to build such a hypersonic communication system themselves. "We hope engineers from all over the world can solve this problem by using our approach," Gao said. "It will give us a sense of accomplishment." Gao and Jiang detailed their findings online June 16 in the Journal of Applied Physics.